Since 2007, Google Safe Browsing has been protecting users across the web from phishing and malware attacks. It protects over three billion devices from an increasing number of threats, now also including unwanted software across desktop and mobile platforms. Today, we're announcing that Google Play Protect is bringing Safe Browsing to WebView by default, starting in April 2018 with the release of WebView 66. Developers of Android apps using WebView no longer have to make any changes to benefit from this protection. Safe Browsing in WebView has been available since Android 8.0 (API level 26), using the same underlying technology as Chrome on Android. 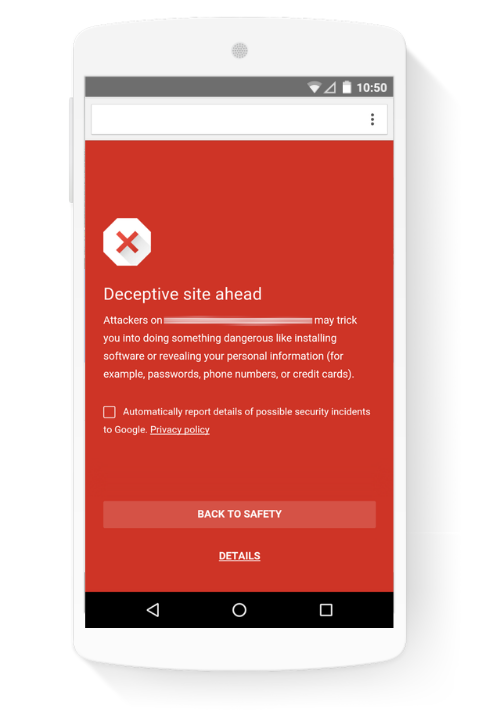 When Safe Browsing is triggered, the app will present a warning and receive a network error. Apps built for API level 27 and above can customize this behavior with new APIs for Safe Browsing. 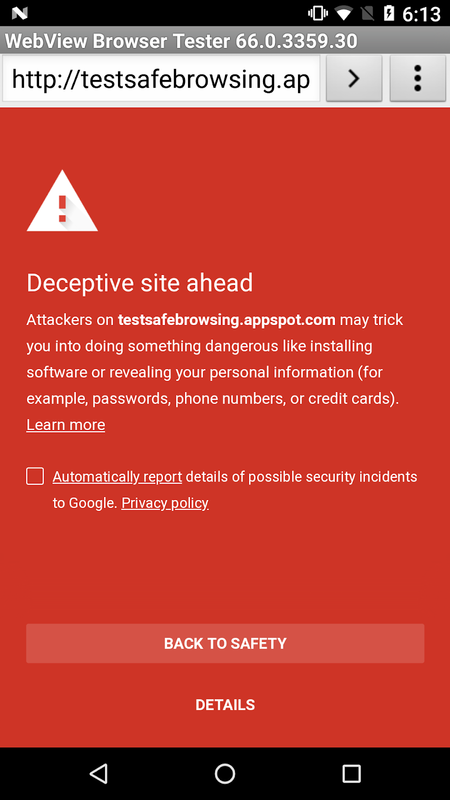 An example of a warning shown when Safe Browsing detects a dangerous site. The style and content of the warning will vary depending on the size of the WebView. You can learn more about customizing and controlling Safe Browsing in the Android API documentation, and you can test your application today by visiting the Safe Browsing test URL (chrome://safe-browsing/match?type=malware) while using the current WebView beta. The processing of external and untrusted content is often one of the most important functions of an app. A newsreader shows the top news articles and a shopping app displays the catalog of items for sale. This comes with associated risks as the processing of untrusted content is also one of the main ways that an attacker can compromise your app, i.e. by passing you malformed content. Many apps handle untrusted content using WebView, and we've made many improvements in Android over the years to protect it and your app against compromise. With Android Lollipop, we started delivering WebView as an independent APK, updated every six weeks from the Play store, so that we can get important fixes to users quickly. With the newest WebView, we've added a couple more important security enhancements. Starting with Android O, WebView will have the renderer running in an isolated process separate from the host app, taking advantage of the isolation between processes provided by Android that has been available for other applications. The rendering engine has been split into a separate process. This insulates the host app from bugs or crashes in the renderer process and makes it harder for a malicious website that can exploit the renderer to then exploit the host app. To further contain it, the renderer process is run within an isolated process sandbox that restricts it to a limited set of resources. For example, the rendering engine cannot write to disk or talk to the network on its own. It is also bound to the same seccomp filter (blogpost on seccomp is coming soon) as used by Chrome on Android. The seccomp filter reduces the number of system calls the renderer process can access and also restricts the allowed arguments to the system calls. The newest version of WebView incorporates Google's Safe Browsing protections to detect and warn users about potentially dangerous sites.. When correctly configured, WebView checks URLs against Safe Browsing's malware and phishing database and displays a warning message before users visit a dangerous site. On Chrome, this helpful information is displayed more than 250 million times a month, and now it's available in WebView on Android. Because WebView is distributed as a separate APK, Safe Browsing for WebView is available today for devices running Android 5.0 and above. With just one added line in your manifest, you can update your app and improve security for most of your users immediately.